Businessweek Names Four Social Media Innovators for 2009: Scott Monty, Noah Brier, Eric Brown and Me! 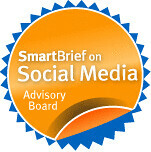 BusinessWeek innovation blog reached out to its readers on Facebook, Twitter, and its blog asking for suggestions for social media innovators for 2009. They got a lot of suggestions and decided to create four different categories (see below.) I was selected as "eyes to the world." The profile is here. I was asked to do a brief video talking about what I thought the next innovation on the web is - you can see here where I talked about how these new tools are allowing people to come together and do things for charities out of love at a grand scale, not just money. I also talked about the next innovation of the social web - as a platform to do good. There's some details in the profile that could stand to corrected, but later for that. Congratulations to the other three folks who received recognition. 1) Toolmasters: Imaginative techies whose schemes and applications open new doors and lead to insights. Our toolmaster is Noah Brier, who works days in New York at Barbarian Group, an interactive marketing shop. 2) Eyes to the World: People innovating with social media to help others. Beth Kanter is our pick. She uses every avenue on the World Wide Web to raise funds for Cambodian children through the Sharing Foundation. And she shares what she learns with nonprofits everywhere. Kanter, 52, is also a Net pioneer. A one-time employee of the Boston Symphony, she plunged into the Internet in the early 1990s. She started tapping friends—and friends of friends—through her blog while adopting two Cambodian children in 2000. 3) Crowdstrappers: Entrepreneurs or consultants who harness new approaches in social media to reposition or invigorate businesses—either their clients' or their own. Here we select Eric Brown, who has turned his apartment business in Royal Oak, Mich., into a social media laboratory. Brown, 49, has no training in social media. But he believes in openness and hopes that the ease of communicating through blogs, Twitter, and Facebook, can turn him into a better landlord. 4) Hidden heroes: These are people working inside old-style enterprises and use social media to change the culture and operations. Our choice is Scott Monty, who heads up social media at Ford Motor. Beth, You are SO deserving! You are our nonprofit light for social media...fantastic content ALL the time!! Congrats. Hey - wonderful news! Congratulations!! I'm a regular reader of your posts, but I've never commented before. Your posts are so informative, you are a knowledge base of Social Media. I always feel that, my comments would never be able to do justice to your posts as I'll run short of words appreciating it. I hope the long flight gave you an opportunity to revel, even if on an airplane. You deserve it. I also hope you realize that the amazing good created by the people in your community is a direct reflection of the content you create, the example you set, the bar you raise, the questions you pose and the dialogue you facilitate. I'm not sure how you do it, but I'm so very grateful you do. Very well deserved! Big Congrats and big hugs! Congrats!! You are by far the shining light of this article and I am so happy to see you recogized for the amazing work that you do. I am always an adoring fan! Congrats Beth! That's a huge honor and extremely well deserved! Just saw this while catching up on reading - Congratulations!! Very well deserved! This is like the third time I have seen and read this post. I should probably take the time to congratulate you, It has to be a grand honor to not only be involved with but recognized for something so huge.